Because they are cosmetically unpleasing, a spider vein treatment may be desired even though usually the veins do not require medical attention. 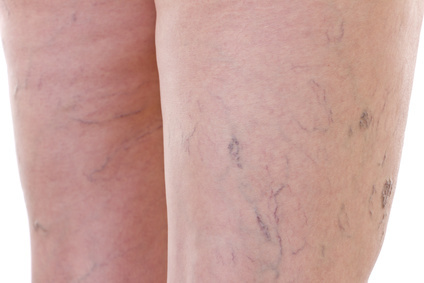 However, varicose veins in addition to being cosmetically unpleasing may become significantly worse and may develop into a more serious condition (see Complications section above). A spider vein treatment is necessary to ease the symptoms of this condition and to prevent them from developing into a more serious health problem. The simplest way to treat varicose veins is to wear compression stockings. These stockings are elastic and squeeze the veins in order to prevent excess blood from flowing backwards. Another benefit of using compression stockings is that they can help to heal sores. Some stockings are graduated in the amount of compression they provide. In other words, the stockings are tightest around the ankle and lower leg and less tight towards the upper part of the leg. Regular use of the stockings is recommended during the day, especially when standing for long periods of time. There is usually no need to wear them at night. The use of these stockings does not prevent varicose veins, but it is an effective way to treat the condition and help to relieve the common symptoms of pain, swelling, and fatigue feeling in the legs. These types of stockings are available in a variety of different compression levels and in a variety of styles. Compression stockings are commonly available at surgical supplies stores, pharmacies, and sometimes in physician’s offices. This spider vein treatment is usually used for all types of spider veins and some varicose veins, although for many varicose veins sclerotherapy is not very effective. A very fine needle is used to directly inject the problem causing veins with a solution, usually sodium chloride. The sodium chloride irritates the lining of the vein and causes it to swell, stick together, and seal shut. Sometimes compression bandages are worn to aid in the sealing of the veins after the spider vein treatment. The blood can no longer use these veins for circulation because it is blocked and the sealed vein then dies and turns into scar tissue. The flow of blood is taken over by other veins. The body reabsorbs the scar tissue and the spider veins fade away within a few weeks. This spider vein treatment procedure can easily be performed on an outpatient basis in the doctor’s office and does not require anesthetic. Recovery time is quick and some bruising will likely be evident after the spider vein treatment. In addition, stinging or painful cramps may be felt and temporary raised red patches and small skin sores may all be present at the injection sites. The treated veins may also become inflamed or develop lumps of clotted blood that can be relieved with the application of heat, aspirin, or antibiotics. Consult with the physician before treating any of these side effects. It is possible that spider veins will reappear or require more than one injection. Overall, this spider vein treatment is effective, with 50 to 90 percent of individuals showing significant improvements. Microsclerotherapy uses improved solutions and injection techniques that increase the success rate and effectiveness of this type of treatment for spider veins. A catheter is inserted into the problem vein via a small incision and is guided by using ultrasound guidance. A solution is injected that causes the veins to scar and close, thereby rerouting the blood to healthier veins. The body eventually reabsorbs the built up scar tissue. For small spider veins on the face or legs and certain varicose veins, laser therapy may be used to selectively remove them. The laser uses intense pulsed light to destroy or damage the spider veins by using heat. This type of spider vein treatment is used when sclerotherapy is not effective. Several treatments may be necessary to realize the full benefits that laser treatments can provide. This is a minimally invasive procedure used to treat varicose veins. Tiny incisions are made under local anesthetic and the problem vein is removed with the use of surgical hooks. The procedure usually takes about an hour and recovery time is rapid. Temporary bruising and numbness may be experienced after the procedure. This procedure is not used as a spider vein treatment, but rather for severe or very large varicose veins. The problem vein is tied off at the top of the leg in the groin area by making small incisions in the skin. For removal, a flexible wire is passed through the affected vein and attached to one end. When the wire is pulled back, the vein is removed or “stripped out”. In addition, smaller cuts along the area where the main problem vein was present may be made to remove smaller varicose veins that were associated with the larger vein. This treatment is performed by a vascular surgeon in a hospital on an outpatient basis under general anesthetic. Recovery time is longer than some of the other treatments. The risks are generally the same as those associated with other types of surgeries when general anesthetic is used such as nausea and vomiting. Of course infection is always possible as well. The ablation treatment uses a catheter (a thin flexible tube). This catheter is inserted into the varicose vein through a very small incision. At the end of the catheter are tiny electrodes or a small laser that act to heat the walls of the problem vein and seal it. Once the vein is sealed, it cannot transport blood any longer and eventually dies and is reabsorbed by the body. This type of treatment takes less than an hour with immediate return to normal activities. Local anesthetic is used for the procedure and some bruising may occur. This treatment is required only in cases with advanced leg ulcers or sores. The procedure takes one to two hours and can be performed under epidural or general anesthetic. A surgeon inserts a thin video camera through a very small incision to examine the veins. The problem veins are then gently removed through the incision points. After this procedure, normal activities can be resumed within a few weeks.